Suunto Ambit2 S is compatible with Suunto ANT Comfort Belt. Adjust the strap length so that the heart rate belt is tight but still comfortable. Moisten the contact areas with water or gel and put on the heart rate belt. Ensure the heart rate belt is centered on your chest and the red arrow is pointing up. People who have a pacemaker, defibrillator, or other implanted electronic device use the hear rate belt at their own risk. Before starting the initial use of the heart rate belt, we recommend an exercise test under a doctor’s supervision. This ensures the safety and reliability of the pacemaker and heart rate belt when being used simultaneously. Exercise may include some risk, especially for those who have been inactive. We strongly advise you to consult your doctor prior to beginning a regular exercise program. 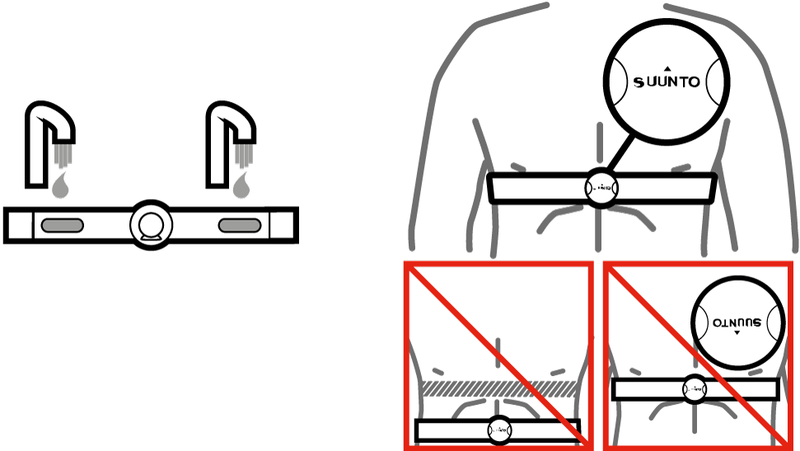 Suunto Ambit2 S cannot receive the heart rate belt signal under water. Machine-wash the heart rate belt regularly after use to avoid unpleasant odor and to ensure good data quality and functionality. Only wash the textile strap. Suunto Ambit2 S supports ANT+TM compatible heart rate belts and certain PODs. Visit www.thisisant.com/directory for a list of compatible ANT+ products.